Many bending jigs are just simple wooden circles with some sort of clamp at one end to hold the bell tail. I used a similar setup for many years and made attempts to improve the results by doing anything from carving grooves, to making negative molds of the bent bell out of fiberglass and aluminum impregnated resin. Three bell bending jigs from my early days; left- a cherry circle that I think Darin Sorley might have given me when I started out, middle- a fiberglass and resin abomination that seemed like a good idea at the time, and right- a jig turned on the wood lathe with a groove to hold the bell on center. The problem is that the bell tail diameter is so large at the big end, it is difficult to find a method that is stiff enough to support the bell, but elastic enough to allow the bell to actually bend into a shape. Often this is when makers will begin arguing over what bending medium is best, but that is actually the wrong place to look. A fully supported bending jig is critical, no matter what the support filler material is. Simple plywood circles just won’t do. This is evidenced by the many pictures showing makers banging out lumpy bell tails with hammers after bending; I banged my share of lumps too. I almost believed (as many still do) that this is just part of the process, rather than an indication that something is sub optimal. Despite using Cerrobend, this bell has significant ripples. (Pic taken from the internet somewhere). Here’s the same section of tail fresh off my bending jig (using pitch). No lumps, no hammering, just a nice, smooth surface. 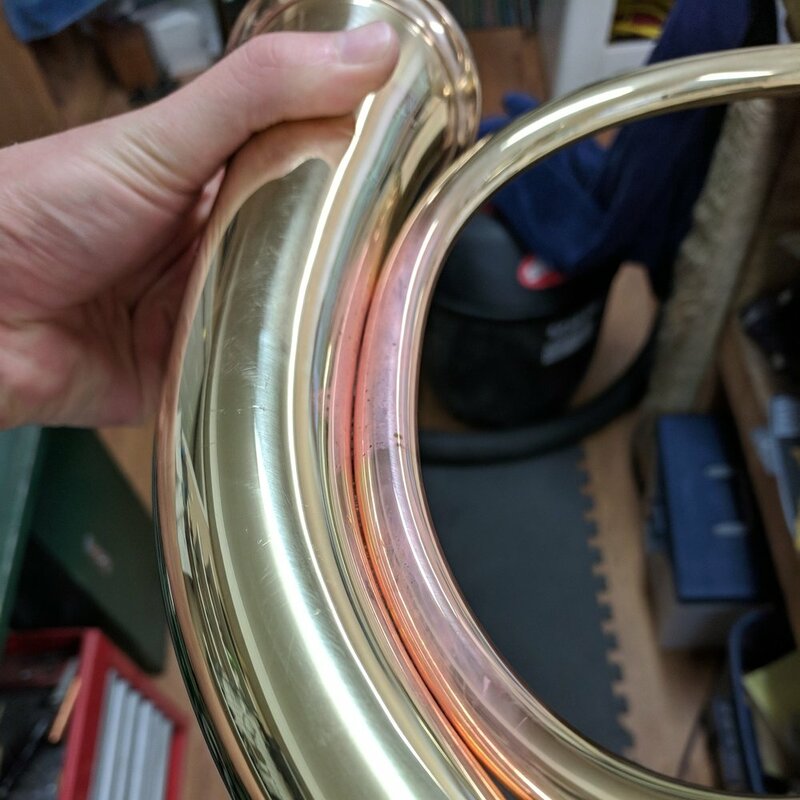 The first step to designing a new bell bend is to actually look critically at the horn and decide where the major diameter of the horn is located. 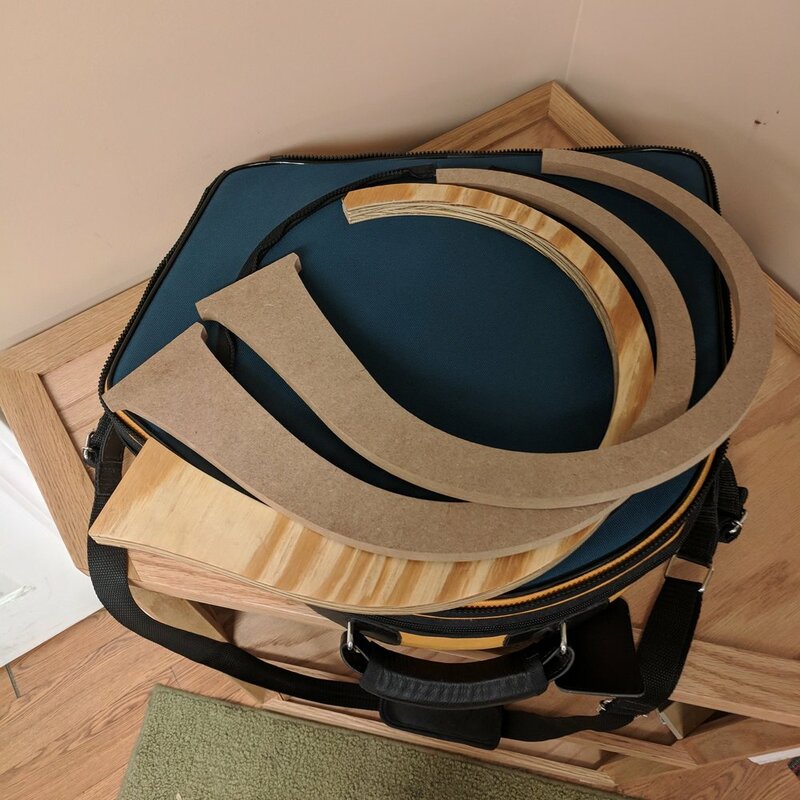 Plywood circles are cut using bandsaws or wood lathes which means that when a bell is bent around the resulting form, the inside edge of the bell tail makes the circle, visually. However, there is another way to locate the circle. Using software, the circle can be made to occur around the centerline of the bend bell rather than the inside edge and the bell geometry changes slightly. It’s better this way and makes the final horn look a little less egg shaped. There are many very nice egg-y horns, but if it can be simply changed into a more convincing circle, why not? After all, isn’t that why hand makers are still around? 3D model of the bell. The top 3 designs were profiled, cut out, and test fit in the MB-3. After deciding where the circle is, the next thing to decide on is wrap size. As usual, I base the size of the wrap based on my favorite case (the MB-3). After some initial testing, I cut out profiles of my favorite 3 shapes to test fit them in the case. My final choice fits nicely in the case and also has a bit of curve at the large end that should give me a longer solder joint between the bell and first branch. When split in half, you can see that the tail has “sprung back” away from the jig. It’s ok though, the jig is calculated to account for this. Building a bending jig is more complex than just simply making a negative shape of the part. Spring back and centerline migration must be accounted for and there is some serious math behind it. The jig has to be made in such a way that the part will spring into the desired shape. This is very tricky to do and one reason that I do most of my tooling in wood. As much math and analysis as there is in each jig, I usually have to make two or three jigs before I dial in all the numbers. If I had to contract these tools out, I’d either be forced to live with something that wasn’t perfect, or I’d be in for many many thousands of dollars. In short, it’s a better bell. And, it’s the foundation of a better horn. The bell on the jig. The follower blocks keep the bell tight to the jig and prevent ripples. Not only is the bend excellent, I get a very good fit with the first branch and need only to tiniest solder bead to complete the joint.